If you thought the shops were looking quiet last Friday then you were right. A whopping £1.4bn was spent on online sales in the UK on Black Friday - up some 11.7% on last year, according to online retailers trade body IMRG. 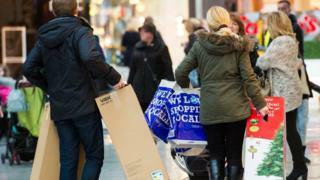 But on High Streets, shopping centres and retail parks it was a different story with footfall figures down 3.6%, analysis firm Springboard said. Online's shopping growth is already an established trend, but IMRG says it works particularly well for sales. "People shop in a lot more places than they would normally. Because they know everyone is offering massive discounts then they are inclined to shop around more. Online lends itself well to that," says IMRG strategy and insight director Andy Mulcahy. Black Friday - bonkers or brilliant? Yet in the battle of clicks versus bricks it isn't just Black Friday that counts. The sales bonanza that kicks off the day after Thanksgiving is now a four-day long event culminating in so-called Cyber Monday. According to online data specialist PCA Predict, UK online sales were up 3% between 11am and 5pm this Cyber Monday compared to last year. It said the peak minute for purchasing goods was towards the end of the working day at 4:38pm. PCA Predict's head of marketing Chris Boaz says people have realised they don't need to brave the High Street to bag a deal. "The days when consumers would be willing to get up early to bag a bargain are gone," he says. Yet the popularity of "click and collect" means people are still eventually making it to the shops even if they did buy what they wanted online. Springboard says numbers picked up over the weekend as shoppers went to collect their purchases. The other impact on shopper numbers, both online and in the shops, is that many shops are now offering deals long ahead of Black Friday. As consumer Group Which? pointed out last week many of last year's so-called Black Friday deals were cheaper or available at the same price at other times of year. Mr Mulcahy says shops often run a discount campaign to drive up sales. "Black Friday's really a psychological thing persuading you that's the best price you can get. "If you put your nose into it then you could get access to pretty good discounts in October and early November," he adds.